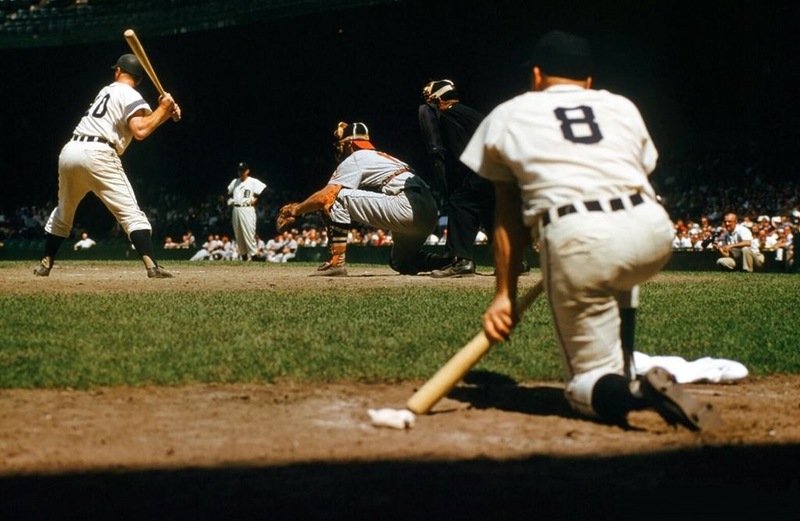 Saturday, June 27, 1959, Briggs Stadium, Detroit. Orioles in town for the third game of a four game set. Tiger C Red Wilson awaits the pitch as SS Rocky Bridges waits on deck. Gus Triandos is the O’s catcher. A part-time catcher, Red made the most of his start this day, going 3-for-3 with a HR and 3 RBIs, raising his average to a season high .333, but would eventually tail off and ended the season at .263. He came close to .300 the previous year, finishing at .299, but would never have a .300 season. And the HR was a rare feat – he only hit 4 that year, and 24 in his 10 year career. 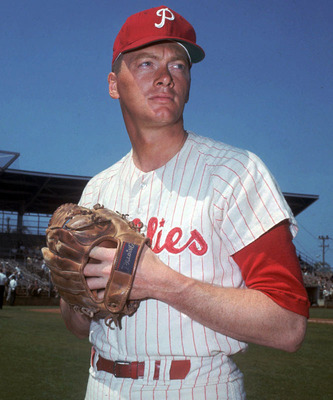 His biggest claim to fame may be catching Jim Bunning’s first career no-hitter in 1958 against the Red Sox (Bunning’s second and last would be the 1964 perfect game at Shea Stadium against the Mets on Father’s Day). Wilson, 30 years old in 1959, was at the tail end of his career, and was traded to the Indians in July of the following season, along with none other than Rocky Bridges, his teammate on deck above (both were traded for C Hank Foiles, who only lasted a half season in Detroit and was then shipped off to the Orioles). Red was then selected by the Los Angeles Angels in the expansion draft for 1961, but instead chose to retire from baseball. He still lives in his hometown of Milwaukee, where he was a star football player for the Wisconsin Badgers (he was drafted by the Cleveland Browns in 1950, but chose baseball instead). Rocky Bridges, 1-4 that day, was also nearing the end of a fairly long career. He had his best year with the Senators in the previous campaign, earning his only career All-Star appearance. 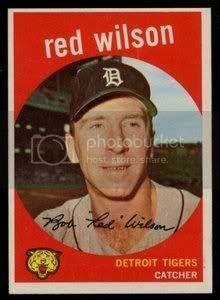 He had a fine year in 1959 for the Tigers, but was befelled by injury in 1960 and would only play 10 games for Detroit until being shipped off to Cleveland with Wilson, above. He then only played 10 games for the Indians and was dealt to the Cardinals, played 3 games and was then released after the season. Another parallel to Wilson is that the Angels also came calling for Bridges, but as a free agent – and unlike Wilson, Bridges took them up on their offer, making Los Angeles the 7th team of his career. Rocky had a fair season for the expansion club in his typical utility infielder role, and then retired, becoming an Angels coach and then minor-league manager in their organization, as well as others, and would actually manage over 2,600 minor league games through 1989. In fact, the early beginnings of Rocky’s managerial career was the subject of an SI article in 1964, which was eventually included in Jim Bouton’s book of baseball essays under the same name, “I Managed Good, But Boy Did They Play Bad”. 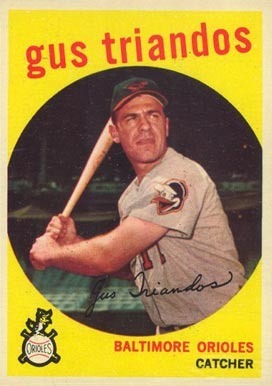 Gus Triandos (who went 1-2 and came out in the 7th inning) was probably the most successful of our spotlighted trio, being a 3-time All-Star catcher for the Orioles (including in this 1959 season). And like Red Wilson, was in the right place at the right time for another first-time no-hitter, this time catching the first and only one thrown by Hoyt Wilhelm, also in 1958 – and it still remains the last no-hitter thrown by one pitcher against the Yankees to this day, over 50 years later. Triandos also had some pop – after a career peak of 30 HRs in ’58 (which tied Yogi Berra’s AL record for HRs by a catcher), Gus was off to the races in 1959, having 18 HRs by late June (above), and may have had a spring in his step before or definitely after the game pictured – the ballot results were announced the very same day, June 27th, and Gus was voted in for the second year in a row as the starting catcher in the (what would be the first of two in 1959) All-Star Game. However, a hand injury would slow his bat, he finished with only 25 HRs and a meek .216 average at season’s end, and would never fully regain his slugging prowess. Gus would rebound somewhat in ’60 and ’61, but with his power primarily behind him, he was traded to the Tigers in 1963. After a fine season, he was involved in what probably turned out to be one of the best trades the Phillies ever made, Triandos and Jim Bunning for slugger Don Demeter and Jack Hamilton (Demeter would have two decent seasons for the Tigers, but Hamilton would be a complete bust as Bunning went on to dominate the NL). And how about the kicker to tie this all together? The traded twosome were the battery for Bunning’s perfect game at Shea noted above – so Red Wilson caught Bunning’s first, and Triandos, Bunning’s second, and last, “no-hitter”. And with that, Gus also became the first player to catch no-hitters in both leagues. By 1965, however, he had mostly lost his hitting stroke, and after being traded to the Astros mid-year, retired at the end of the season. But back in Briggs/Tiger Stadium on a beautiful, sunny, early summer Saturday afternoon (oddly enough before only 10,856 fans), Red Wilson’s 3-for-3 helped pace the Tigers to a 12-2 thrashing of the Birds of Baltimore. A 25-year old Al Kaline would hit one out. Tiger Gus Zernial would hit two more. 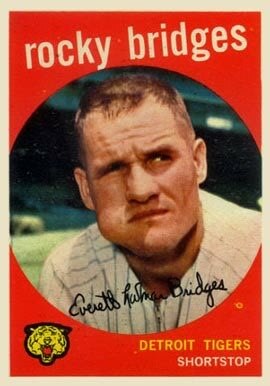 Billy Hoeft, the Oriole pitcher who got knocked out of the box in the third inning, was just traded from Detroit to Baltimore, and maybe the Tiger batters knew the weaknesses of their old teammate. And at day’s end, the Tiger faithful went home happy, Detroit creeped back over .500 at 36-35, only 3 games behind the Indians, the Orioles held steady only 1 game back, and the rest of the last summer of 1950’s baseball had yet to be played; perfect games, long managerial careers and even hometown retirements would have to wait. I love your blog and your posts on Baseball Fever. Very nice work. Tom – Any piece for Tito Francona of the Indians, circa 1959-mid ’60’s. I always liked him. What a great guy!